In the early days of virology, researchers and clinicians could only identify and classify a virus based on its infectivity and associated pathology. Viruses could not be more closely described because of their extremely small size; virion particles can range from tens to several hundred nanometers (nm). 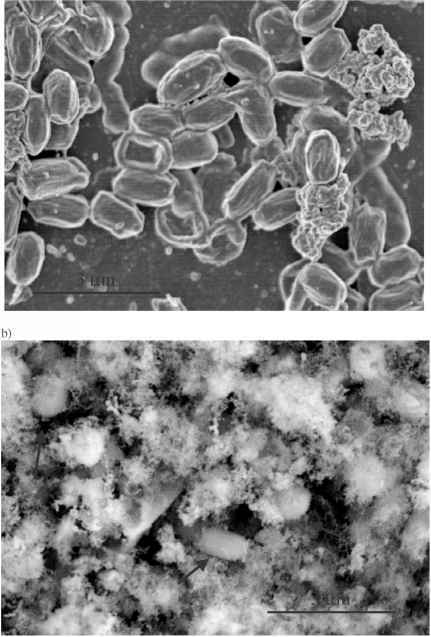 The light microscope, which is a valuable instrument for the identification and study of fungi, bacteria, mold, and spores, does not have the resolving capacity to visualize virus particles. Virologists were limited in their investigations until the 1930's, when the electron microscope (EM) was invented. This instrument uses, instead of visible light, a beam of electrons to form an image of the specimen. The instrument not only produces extremely large magnifications (up to 1,000,000x) but also resolves fine structure at such magnifications. Virus morphology is as diverse as that seen in other microscopic organisms. Because of this, viruses can be identified based on their appearance under the microscope. The researcher is able to examine both the external and internal structure of the virus. 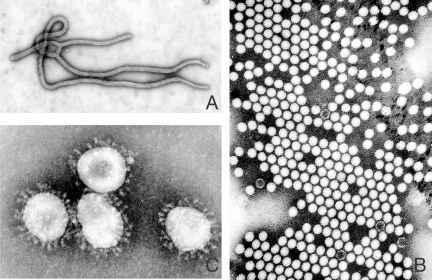 Particle morphology has been observed to appear ribbon-like (rabies), rod-shaped (measles), spherical (poliovirus), and filamentous (Ebola) (Figure 4.3). Many viruses show multiple morphologies under the microscope and are referred to as pleomorphic. An example of a very pleomorphic virus is influenza A, which can appear kidney bean-shaped or filamentous. Some viruses have very characteristic spikes, club or pin-like projections present on the viral envelope. A very interesting example of spikes is seen in the emerging SARS virus. FIGURE 4.3 (A) Ebola virus particles showing filamentous morphology. Courtesy of the CDC/C. Goldsmith. (B) Polio virus particles showing spherical morphology. Courtesy of the CDC/Fred Murphy, Sylvia Whitfield. (C) SARS virus showing indicative "corona-like" morphology. 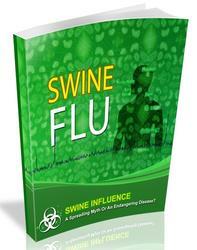 Courtesy of the CDC/Fred Murphy. There are two main types of visualization for virus identification using EM. The first is negative staining/contrast, which was a revolutionary visualization technique designed in the late 1950s. Due to the low level of electron scatter by viral particles, direct contrast and visualization are difficult. However, using the negative contrast technique, the virus particle is visualized on a black (electron-opaque) background. The degree to which the heavy metal salt stain (electron-rich) penetrates into the virus particle determines the contrast/resolution of virus structure. This procedure provides very useful information on the external structure of the virus, but is somewhat limited in resolving internal structure. Thin sectioning is a very important sample preparation technique that allows internal structure to be visualized. Tissue samples are embedded with an epoxy-resin, and thin slices are prepared using an ultramicrotome. These slices are then examined using various electron-dense stains and antibodies that can be used to tag specific cellular organelles and virus proteins.